Threshing Days - Wheat Heritage Engine and Threshing Company Inc. 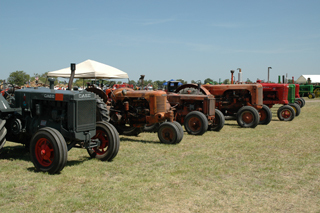 The Company’s major event is the annual old-fashioned country threshing demonstration and show in Goessel, KS. 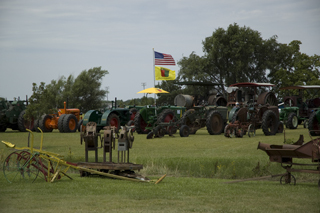 More than 100 exhibitors from a 7-state area display and demonstrate antique equipment related to farming during the past century. Additional demonstrations and ethnic Mennonite food are provided in conjunction with the Mennonite Heritage & Agricultural Museum. Country Threshing Days is August 3 through August 5, 2018. This year we are featuring Minneapolis Moline. Admission is five dollars at the gate or four dollars in advance. Admission is free for children under 12 years of age. Advance admission buttons are now available at Keith’s Food and the Mennonite Heritage & Ag. Museum in Goessel. Admission buttons are good all three days. 2:00 p.m. and 4:00 p.m.
​10:30 a.m. - 4:00 p.m.
11:00 a.m., 1:30 p.m., 3:00 p.m.
11:30 a.m., 2:00 p.m., 3:30 p.m.
2019 Country Threshing Days is August 2, 3, and 4, 2019. The feature is John Deere. Goessel, Kansas (population 500) is located on highway K-15, about 12 miles north of Newton and 40 miles north of Wichita. It is nestled in the heart of Central Kansas Mennonite communities. Click here for a printable map of the show grounds. 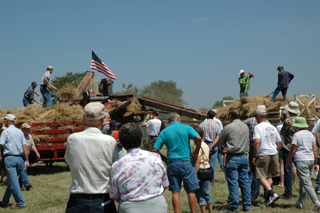 Anyone desiring to exhibit or demonstrate equipment is welcome to do so during the Country Threshing Days. Exhibitors receive free admission. For further information contact us. Vendors are also welcome during the Country Threshing Days. More information on the Contact page. ​Campers are welcome, however no hook-ups are available on the show grounds. Local facilities are available in Hillsboro or Hesston. Four RV hook-ups in Hillsboro, which is 15 miles north-east of Goessel. For more information visit: cityofhillsboro.net/forms/84-facilities-rental reservations can be made in advance by contacting city hall (620)-947-3162. Twenty-two RV hook-ups in Hesston, which is 12 miles south-west of Goessel. For more information visit: cottonwoodgrove.com or call (620)-327-4173.